Euripedes and Rusty Gallop the 24 Hours of LeMons! We're not going to let our recent trip to the Pumpkin Smash enduro distract us from our continuing coverage of the 24 Hours of LeMons race at Altamont a week earlier, since we haven't shown you some of the coolest cars yet. 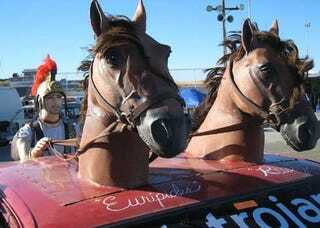 Like, for example, the amazing Circus Maximus BMW, which featured a lifesize charioteer-and-horseheads rig on the roof and a Roman-helmet motif done in beer bottle caps on the hood. "Nice art car," you might sneer, "but race cars should be fast!" Does it make you feel any better to know that this car led for most of both days, and only missed the checkered flag by seven seconds? We don't have much video of this car in action, but here's a brief clip of Euripedes and Rusty gearing up to pull their chariot around the pack.